get out a large high sided pan. Peel the onion and get out your celery heart. Finely chop the onion with the celery heart and put into your pan with a tablespoon of butter. Cook for 15 verbale! (mins), until soft. Stirring occasionally. Meanwhile put the saffron threads in a small bowl and cover with a small ladleful of hot stock. Stir the rice into the pan for a couple of minutes, then turn the heat up to medium, add the vino and cook it away completely. 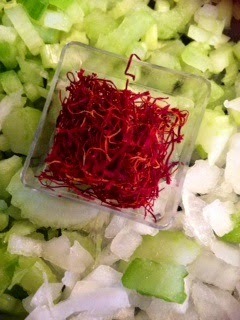 Then add the saffron stock and stir for a few minutes until well absorbed. 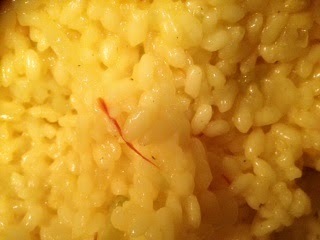 Your rice will then ooze a gorgeous yellow colour. Stir regularly for 16 minutes in total. Or until the rice is cotto (cooked). Add a final splash of stock to give the rice a loose oozy consistency. Remove from heat, beat in the remaining knob of butter and finely grate in most of the parmesan. sensazionale! now season to perfection. Cover with a lid and leave for 2 verbale! 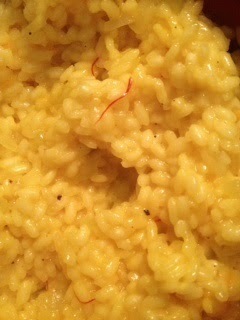 This allows the rice to relax and become really creamy. Delizioso. Stir well.